Grab your Nintendo Switch; Inti Creates' Might Gunvolt Burst is primed and ready to download! The game sees the return of Mighty No. 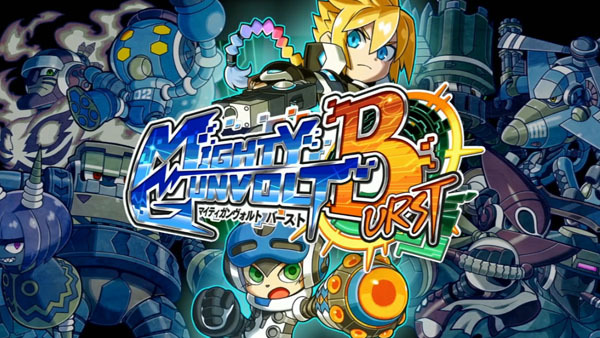 9's Beck teaming up with Gunvolt for a new, retro-infused adventure. I'll have a review up later this weekend, but I will say finishing off enemies at point-blank range - literally shooting things in the face - is all too satisfying. The game will cost you a cool $9.99. If you're a Nintendo 3DS owner, Mighty Gunvolt Burst drops on Thursday, June 29th. Look forward to it! I'm so excited for this game! But why the 3DS users (like me) have to wait another two weeks? Is not like the game would be too different from the Switch version. It's probably some kind of marketing strategy to make you want to buy a Switch, I dunno. I mean, everything comes out on Switch first, and other versions are released weeks later. Even though I'm fairly skeptical of anything Beck gets put into these days, this game looks like fun, and I can always use more things to play on the Switch. I prefer it to have a physical one.. I would buy a physical version. No digital at all. Soon as I get home, this game's mine! I really hope we'll see some honest reviews of this game shortly. Maybe it's better than I'm expecting? Or maybe it's worse? I'm just not a fan of games that reward you with something that's absolutely, positively counter-intuitive... like getting in enemies' faces with ranged attack characters to maximize score and damage. I don't use Burst attacks at all, and since the only point of them is to get more points, they're pretty much unnecessary. I actually had fun with the game, didn't feel forced to use an odd mechanic like MN9's dash mechanic. Also the customization for Beck is really sweet. Just wish you could switch between your different setups on the fly with L/R instead of using the Pause Menu. I thought it was just the score in this one. Having bought Burst yesterday (alongside Master Blaster Zero), I can say it's definitely a full-fletched MM-style game. Lighthearted, straightforward run-jump-shoot action, but with a tremendous wealth in character customization. Aside from several Gunvolt elements, I'd almost describe it as a complete retro remake of MN9. And the effort to get it right this time really shows. My only gripe so far has been the sheer size of enemy lifebars, but I'm sure further upgrades to the Custom Shot will alleviate that issue. Okay, see now... saying that makes me want this game. A good Mega Man-styled game with an almost overwhelming amount of customization options? You have me sold. Here's hoping there's an an auto-fire and 5-shot mod for Beck. That was my favorite combo in Mega Man 8. There is! You can set 5 Bullets on screen and auto fire with both characters. As of now, one of my better builds with Beck is a full auto 5-shot homing missile with an explosive after-effect. It just melts bosses, especially once you add their elemental weakness. Looks like I'll be doing my best Philip J. Fry impression come the 29th, in that case. And probably doing a lot of excited wiggling in anticipation until then! Any word on possible DLC? I could have sworn IntiCreates did say 'melee character coming' on one of their streams for this game. Any word of this getting on Steam or PC?